This is our BJJ guide for beginners and if you are curious about starting martial arts and want to know how to go about it then you have come to the right place. Today I will talk you through all of the questions beginners have. If you would like to find out about how long it takes to get each belt then click here. Otherwise, carry on reading. Firstly we will start this BJJ guide with what the difference between Gi or No-Gi is and the main one is what you wear. This is a Gi. It’s similar to a Judo Kimono but it’s thicker and heavier. It also normally comes with more patches than it’s Judo counterpart. 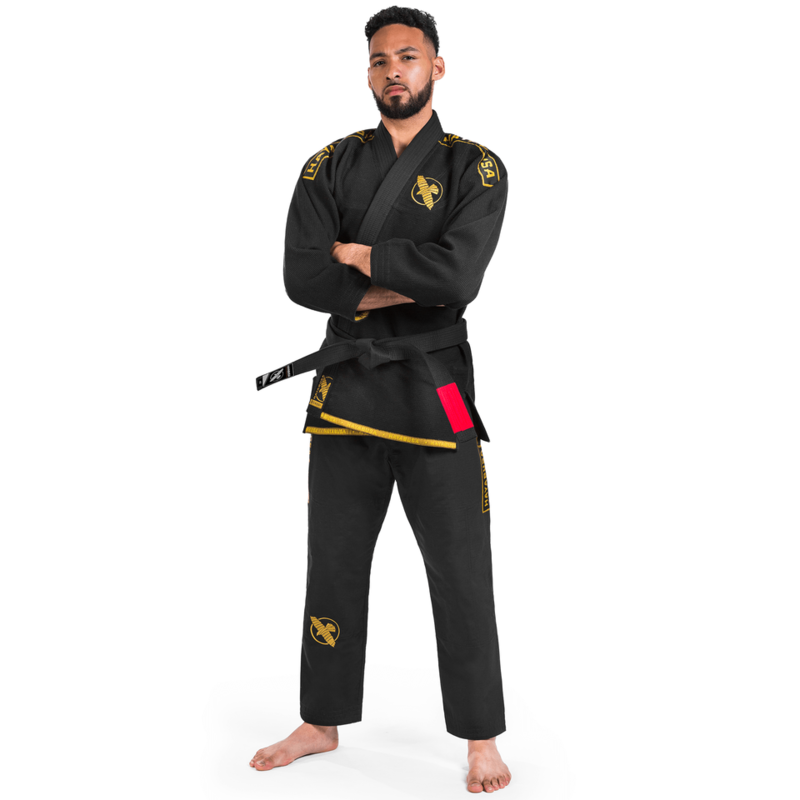 This is what you will wear when you train Gi. The pants, jacket, belt and a rashguard if you want. In No-Gi you will just be in a rashguard and shorts. Don’t worry about wearing any type of support though. Pretty much everyone who trains has some small injuries and you will find a lot of people wear joint supports and tape around there fingers and hands. Make sure you don’t show up to your first class in a t-shirt. As your top will be loose someone might catch a finger in it and may injuring their hand. Also, don’t wear or shorts with zips or pockets. These can be dangerous for anyone that you are training with as if the zip catches them it may end up cutting them. Also don’t be that guy who’s too good for a gum shield. Everyone wears them for a reason and if you have to start with a boil and bite then so be it but I’d recommend investing in a proper one which you can get from your dentist. Just because there are no punches being thrown in BJJ doesn’t mean you won’t catch an accidental knee to the face one day. So get a gumshield. Now we have got that out the way, time to discuss what’s better. And the answer is it’s completely up to you. I started off training No-Gi, it’s easier to get into, cheaper as you don’t need to splash out on an expensive Gi and feels more natural for most people and a Gi can be restricting. I eventually moved onto Gi and I’ve been training it ever since. The Gi allows you to perform more moves. You can grab onto it and even use it to tap your opponent. I personally think it’s better to train mostly Gi and do some No-Gi on the side. If you try to do it the other way around then you may start to get caught out by moves you have never seen before but like I said its completely up to you. And it depends entirely on your training. If you want to have some MMA fights then No-Gi may be better for you. There are hundreds of different companies making Gi’s these days and each company seems to offer you something new or different as well. The main types of Gi’s are Gold Weave, Pearl Weave, Lightweight or Ultra Lightweight and Competition. If you would like to read more about them and find out which one is best suited for you then click here. You will find most gyms offer a few different classes. These range from Beginners or 101 to Advanced and Competition. Depending on where you train there may even be a few more options. If you have never trained before then I would recommend going to the beginners class, they are there for a reason. You will learn how to perform some basic moves and learn what you can and can’t do. Every class is different but most gyms follow a similar routine. Most start with a small warm up and then on to pass guard. Pass guard is a pretty standard part of every class. It’s normally just some light training to get you warmed up. You will start with a partner, one will start on their back with the other between his legs, just like in the image below. If you start on top then it’s your job to “break” your opponent’s legs and then either pass to get side control or get on top in mount. And if you are on the bottom then you will have to sweep your partner. This basically involves turning him over so you have swapped positions and you are now on top and your partner is where you started. After about 5 minutes of this, you will go on to some technique. Your instructor will show you a move that you will practice on your opponent. Depending on the type of class you may learn a few and spend a lot of time getting everything perfect or you will move straight onto rolling. Rolling is where you practise what you have just learned. You will take your new techniques and try them out for real. And if it’s a competition class or open mat then you might even go straight into rolling without any technique at all but this isn’t recommended for beginners. So you may just want to start with the beginner’s classes so you can spend more time learning moves as you are justing getting into the sport. You won’t be rolling every single class. Sometimes there will be too many people on the mat so you have to sit out for a roll. You may find that you get split up into groups. Which allows you to roll with people who are a similar skill level to you. Either way, you will be watching sometimes so take advantage of this time and watch everyone roll. Training with more experienced partners is one of the best ways to get better. You can even still learn from them while you are sat out though. Just watching higher belts will improve your game and you will pick up things that they do and you can try it for yourself. They might not always admit it but your instructors may keep some of there favourite techniques back from you. If they gave everything out then people will start to defend against them better. If you are watching, however then you might spot something useful. Which everyone else has missed because they’ve been talking the whole time. Hopefully, this BJJ guide has been useful to a few of you and shed some light on BJJ. And remember to keep your eyes out for our next guide.